Hawaii Hotels - Visiting the Big Island? Looking for a hotel on the Big Island? Experience the Aloha that the resort hotels lack. 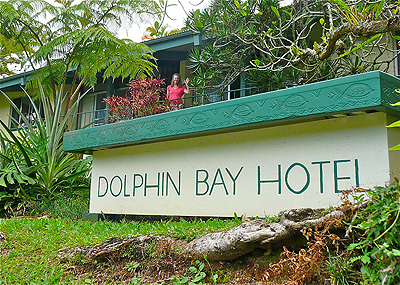 Just a short walk from downtown Hilo, Dolphin Bay Hotel offers comfortable accommodations at a reasonable price. We are a small hotel catering to those who want to get out and see Hawaii. During your next Hawaiian vacation, stay at the hotel rated the nicest small hotel in the Hilo area. Find out why most of our clientele are repeat visitors. We invite you to take a look around our website. See what our rooms look like, take a look around the hotel grounds, get the latest information about Kilauea Volcano or sign our guest book. Here you will also find information on the various regions of the Big Island to help you plan the best Hawaiian vacation possible.